With the emergence of social networking as a formidable force in this Internet era, taking advantage of its powers in fields other than just entertainment was only an obvious consequence. 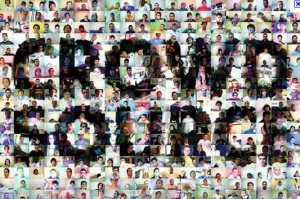 The word crowdsourcing first emerged back in 2005, coined by the editors of Wired Magazine. Jeff Howe from wired magazine defines it as the act of a company or institution taking a function once performed by employees and outsourcing it to an undefined (and generally large) network of people in the form of an open call. This can take the form of peer-production (when the job is performed collaboratively), but is also often undertaken by sole individuals. The crucial prerequisite is the use of the open call format and the large network of potential laborers. It is the ability to harness the data exchanged by the population aka “the crowd”, and use them to produce information useful for the same crowd. Jeff Howe went on to become a proponent in this field, citing examples from all around the Internet Globe (the iGlobe, as I would call it) on how the power of the masses can be strategically taken advantage of. Sometime back, I happened to mention about one of those terms which has been gaining popularity, viz Collaborative Consumption . Crowd sourcing can be viewed as a subset of this idea. Perhaps one of the biggest in the industry to take advantage of this was Waze . With its data being fed in by the millions of drivers on the road, it started to become a powerful navigation system, often even claimed to have been surpassing the giants such as google maps and apple maps . But as has been the common norm amongst the technology industry, it too got acquired for a huge price by one of those giants. But that was only the beginning. Along came Sky Motion in a different field – the weather! Forecasting weather has always had its degree of unpredictability. The intensity of the weather conditions have been known to be inaccurate often times. What if you have a real time update from a person who is actually in the middle of it? That is exactly what Sky Motion has tried to do. Although not as widely accepted yet, just as in the case of Waze it does have the potential to turn into something big. Now they are not the only ones that have imbibed this idea in weather. Weddar is another one such company. So now we have a healthy competition! As weather and traffic seemed to have started to see the useful side of crowdsourcing, Im sure many more would follow. What was ones the supreme power of the ancient civilizations, the society, could soon turn into the superpower in the Internet Civilization!